Today, I’m going to show you how to use Posts Table Pro as a WordPress job board plugin. This WordPress table plugin is an ideal way to list job vacancies in an easy-to-find format. Job hunters can quickly search, sort and filter the list of jobs to find the vacancies they’re interested in. I’ll also show you how to add extra features to the job portal. This includes online job applications, a ‘Submit a job’ form with PayPal payments, and automatic expiry dates for when a job reaches its closing date. I’ll provide step-by-step written instructions as well as a YouTube video tutorial that you can follow along with. Create a job board on your WordPress site. Before we start, I’ll share two case studies of companies who have used this tutorial to create a real-life WordPress job board. Afterwards, I’ll tell you how to do the same on your own website! Cardiac Output is a cardiology job board owned by ourselves at Barn2 Media. It has been the UK’s leading cardiology job portal for over 25 years. We took it over back in 2013 to give it a fresh start and modernize its online presence. We originally used WPJobBoard as the WordPress jobs plugin for Cardiac Output. However, it has never been as reliable as we would have liked. And at $97/year, it was more than we wanted to spend on a WordPress job board plugin. Our web host WP Engine recently told us about a security loophole in WPJobBoard. This was the final straw, so we decided to rebuild the job manager using our own Posts Table Pro plugin. Posts Table Pro is hugely popular as a WordPress job board plugin, and lots of our customers use it in this way. It made perfect sense to use it for Cardiac Output, so we decided to make the change. In this tutorial, I will tell you exactly how I used Posts Table Pro to create a WordPress job portal for Cardiac Output. I’ll include detailed screenshots and a full video tutorial. You can even see it in action on the Cardiac Output website! This will give you everything you need to create your very own WordPress job board. 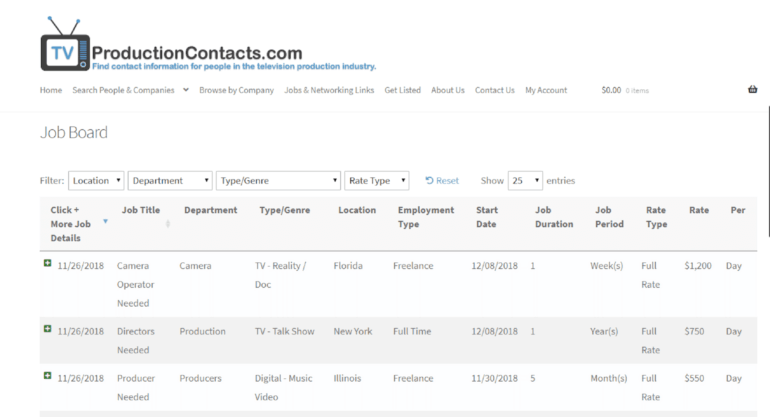 TVProductionContacts.com is a networking site for professionals in the TV production industry. 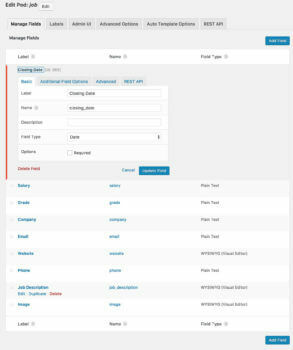 The site’s creator wanted to add a sortable job board to his site, to do this he chose to use Posts Table Pro. And this is the tutorial that he used to help him create the job board. The job board has been customized to show just the right amount of columns. Info varies from job title and location, to rate of pay and contract duration. Job seekers can quickly sort through the table by using the dropdowns above the job board to filter out what they’re looking for. The table is easy to manage as there’s a job submission form powered by the Gravity Forms plugin and the Gravity Forms + Custom Post Types add-on. Once each job submission has been approved, the table is automatically updated with the information. IanMartin.com followed the instructions in this tutorial to create a job board for their WordPress website. They chose the Posts Table Pro plugin specifically because it handles custom post types and displays jobs in the required layout. Each job is added to the custom post type created by the Matador plugin. The jobs can be divided into categories and industries, with an ‘Industry’ filter dropdown above the table. This makes it easy for jobseekers to sift through the long list of jobs and quickly find jobs in their industry. They can also click on an industry in the table to filter by that industry. As well as the central list of all jobs, they have used the job board plugin to list jobs from specific industries only. For example, there’s a page listing Power Generation jobs only. They also have location-specific pages where users can sort by location to find jobs in their area. Read on to find out how to create your own job board. WordPress website with a theme, a domain name and hosting. Pods – you’ll use this free plugin to save your jobs in the WordPress back end. It does this by creating a ‘Jobs’ custom post type, which adds a dedicated Jobs area to the WordPress admin. This is where you’ll create jobs, add extra fields of information, and structure jobs into categories. Posts Table Pro – this WordPress job search plugin lists your jobs in a table layout on the front end of your website. It provides extra features such as search, sort and filter. (Optional) Post Expirator – use this free plugin if you want to automatically remove vacancies from the job board after the closing date. (Optional) To add even more features to your WordPress job board portal, you can use a WordPress forms plugin (e.g. the free Contact Form 7 plugin) to take job applications online. Or you can use Gravity Forms to create a ‘Submit a Job’ form where employers can post vacancies directly to your website. To build a WordPress jobs board, you need an area for storing the job vacancies. We’ll do this by creating a ‘Jobs’ custom post type. You’ll have a dedicated ‘Jobs’ section on the left hand side of the WordPress admin. This keeps your job vacancies separate from other content, such as pages and posts. Install the free Pods WordPress plugin. Find the ‘Pods Admin’ link in the bottom left of the WordPress admin. Click ‘Add New’. Click ‘Create New’ on the next screen. Content Type – Custom Post Type. Singular Label – The singular name for your jobs, e.g. ‘Job’ (make a note of this, as you’ll need it to list the vacancies using the WordPress job board plugin in Step 2). Plural Label – A plural name for your vacancies, e.g. ‘Jobs’. Stay on the ‘Edit Pod’ page, and continue to Step 1b (below). Next, it’s time to use the Pods plugin to create custom fields and taxonomies. These let you store extra data about each job vacancy in WordPress, such as job grade, hours, job description download link, and ‘Apply now’ button. Use custom fields to store one-off data about each job, such as the job reference or ‘Apply now’ link or button. 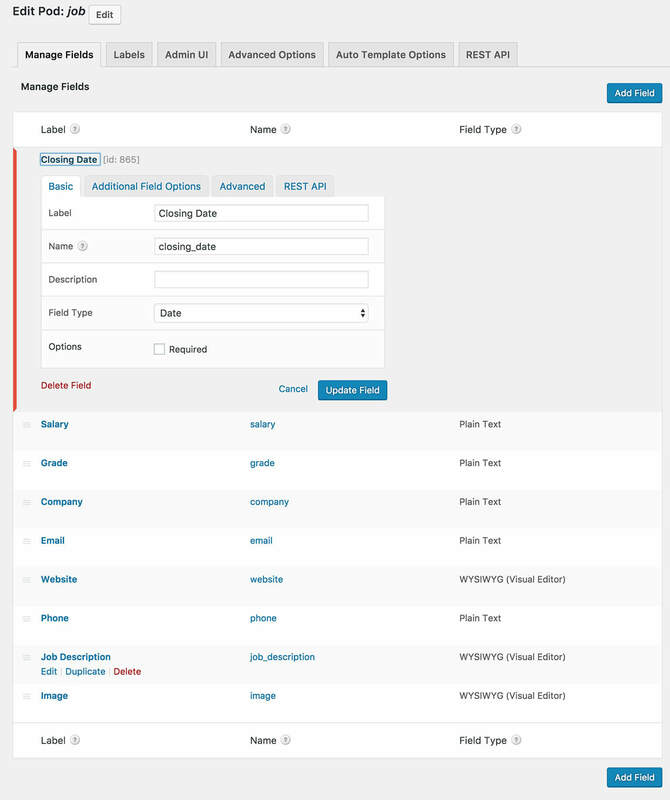 Use custom taxonomies for data that you want to use to filter the WordPress job portal. For example, you might want to add filter dropdowns so that people can refine the jobs list by grade or hours, so use custom taxonomies for these. Tip: You only need to create custom fields or taxonomies for data that WordPress can’t store by default. Your Jobs custom post type can have all the standard WordPress core fields such as title, content, excerpt, featured image, tags and categories. You just need to create any additional fields that are needed on top of this, such as working hours or salary. You should already be on the ‘Edit Pod’ screen from Step 1a. Click ‘Add Field’. Choose a Label for the field. When you click in the Name field, Pods will automatically create a name for the custom field based on the Label.Write this down, ready for when you list the jobs in Step 2. Choose a Field Type from the list. Pods supports various types of field, and you can read more about them in our full tutorial on using Pods with Posts Table Pro. If you’re planning to add clickable links or buttons to any of the fields in your WordPress job board, use the Text or Visual Editor field types. Text is good if you’re comfortable writing HTML, and Visual Editor is good if you prefer to use the WordPress toolbar to create links etc. If you’ve selected any text fields that you plan to add HTML or shortcodes in – for example to create a clickable link – click on the Advanced tab and enable HTML and shortcodes. Repeat these steps for all the custom fields that you wish to create. Next, go to the ‘Advanced’ tab and scroll down to the ‘Supports’ and ‘Built-In Taxonomies’ sections. Select any other types of field that you want to be able to store about your jobs, such as title and content. Go to Pods Admin > Add New and click ‘Create New’. On the next screen, don’t bother adding any fields – you’ve already done this for the Jobs custom post type, and don’t need any fields for the taxonomy. Go straight to the ‘Advanced Options’ tab and scroll down to find the ‘Associated Post Types’ section. Tick the Jobs post type you created in Step 1a, and then click ‘Save Pod’. Now, you’ll see a ‘Jobs’ section on the left of the WordPress admin. This is where you’ll manage the vacancy in your WordPress job board. When you create a job board, you’ll see all the extra fields available to fill in for each job listing. Go to Jobs > Add New on the left of the WordPress dashboard. Add all the information for the job and click ‘Publish’. Repeat steps 1 and 2 for each job vacancy. Ok, so now you’ve finished creating the backend infrastructure for your website job portal. The next step is to use Posts Table Pro as a WordPress job board plugin that will list your jobs in a filterable table layout on your public-facing website. Install and activate the Posts Table Pro WordPress table plugin. Go to Settings > Posts Table Pro and save your license key. Add the following shortcode: [posts_table post_type="job" columns="image,title,content" shortcodes="true"]. Under post_type=”job”, replace “job” with the correct singular label for the custom post type which you created in Step 1a. Save your page and preview it. This shortcode will create a job board with columns for image, title, company, hours, location, closing date, job description and website link. If you’ve added clickable links or other HTML content to any of your job fields, then you also need to add shortcodes="true" to make them display correctly in the list of jobs. Use this shortcode as a starting point, replacing my columns with the actual singular labels of the custom fields and taxonomies that you created in Steps 1b and 1c. Now, save the job listings page and view it again. You’ll see a fully functional WordPress job board with various columns of data about each vacancy. Job seekers can sort by any column or use the search box or filters to find a job. If you’ve included any custom taxonomy columns in the list of jobs, then they can also click on this to filter the table. Any links or buttons will appear as clickable links in the job board. In your WordPress job board, you’ll see that people can click on the job title or image to access a separate page about that job. This page will show the job title, main content (where you may have added the full job description or person specification), and possibly the featured image – depending on your theme. If you’re technically minded, then you can create a custom template for the Jobs post type and use it to display the custom fields and taxonomies. For non-developers, I recommend posting a job on Codeable – this is a good way to find good developers with specific skills. If you don’t want to create a custom template, then you can use Posts Table Pro to display the custom fields and taxonomies directly on the single job pages. I’ll tell you how to do this next. It’s a neat way to show custom fields and taxonomies for specific jobs without having to edit any template files. On the Cardiac Output job site, I used Posts Table Pro to display the custom fields and taxonomies for each job at the top and bottom of the individual job page. For example, in this screenshot you can see 2 extra tables, which I added directly to the main content box for the job vacancy. The first table shows the job image, working hours, company name and location. 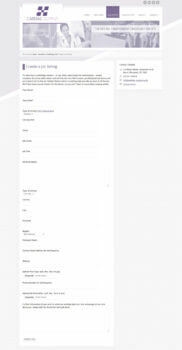 The second table appears under an ‘Apply for this job’ heading and contains the contact details for enquiries, plus buttons linking to the downloadable job description and website. Add id="123" to the Posts Table Pro shortcode, replacing 123 with the ID of the job vacancy post. You can find the ID by going to the Edit Job screen for that job, and looking for post=123 in the URL. For example, if the URL ends in /wp-admin/post.php?post=33563&action=edit then the ID for the post is 33653. Add links="none" to the shortcode to disable the links to the single job page. Your users are already on that page, so these links aren’t needed! Add page_length="false" reset_button="false" search_box="false" totals="false" to the shortcode. This will remove any elements you don’t need such as the number of jobs and search box, which aren’t appropriate here. Lots of WordPress job boards need to automatically expire the job listings when the closing date passes. This saves manual work, as you don’t have to set a reminder to delete the job on the closing date. You can easily achieve this by adding the free Post Expirator plugin. 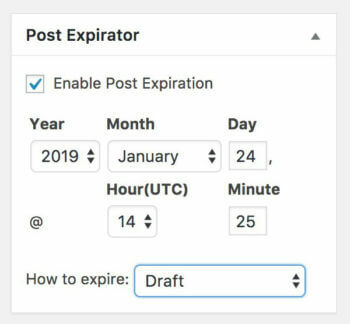 Install the plugin and it will add a ‘Post Expirator’ box on the right of the Add Job screen. Use this to set a job vacancy expiry date to change the job status to ‘Draft’ when it expires. Can jobseekers apply for a job vacancy online? It’s easy to add an ‘Apply online’ facility to your WordPress job board or portal. You just need to create an enquiry form to use alongside the WordPress job board plugin. Install Contact Form 7 and go to the ‘Forms’ section on the left of the WordPress dashboard. Use the Contact Form 7 Documentation to create a Job Application form with all the fields you need. You can create short or long text fields, check boxes, radio buttons, and even extras like file uploads. 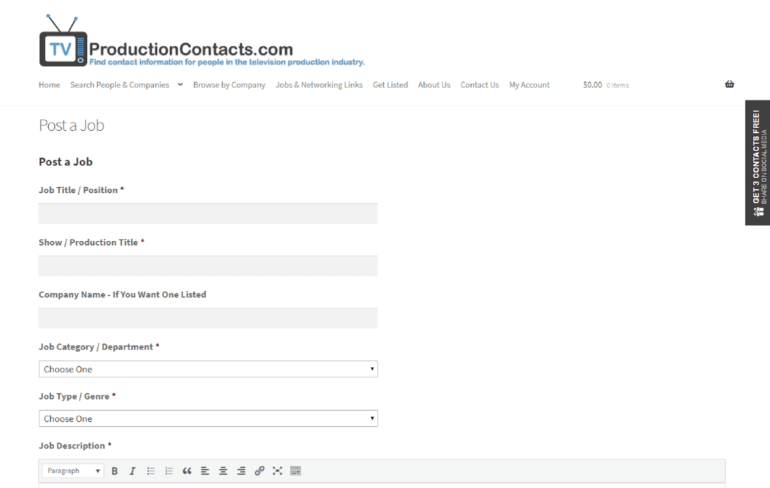 Add the contact form to a separate page on your website. Next, add an ‘Apply for Job’ link to one of the fields in your job board. I recommend creating a custom field for the job application link (see Section 1b, above). You can display this as a column in the job board table (see Section 2). For each job, add a clickable button or link to the page with the contact form. Do I need a separate application form for each job? It’s entirely up to you. The simplest option is to create 1 job application form and use it for all your jobs. Include a compulsory ‘Job Title’ field in the form so that applicants can tell you which job they’re applying for. Alternatively, you could create a separate form for each job. This is obviously more work, or you could ask a developer to dynamically generate separate forms for each vacancy and link to these from the ‘Apply for Job’ column in the job board. Can I link to a 3rd party job applications page? Absolutely. If you want people to apply via a third party job site (e.g. NHS Jobs if you’re listing NHS jobs), just link to that URL from the ‘Apply for Job’ column in your WordPress job board, instead of using your own contact form. If you’re just using the WordPress job board plugin to list your own job vacancies, then you can stop now and start setting up your jobs portal. Keep reading if you want employers to be able to post job vacancies directly to your website. Can employers submit and pay for jobs online? If you want employers to be able to post jobs on the website, then you can do this with the Gravity Forms WordPress forms plugin. 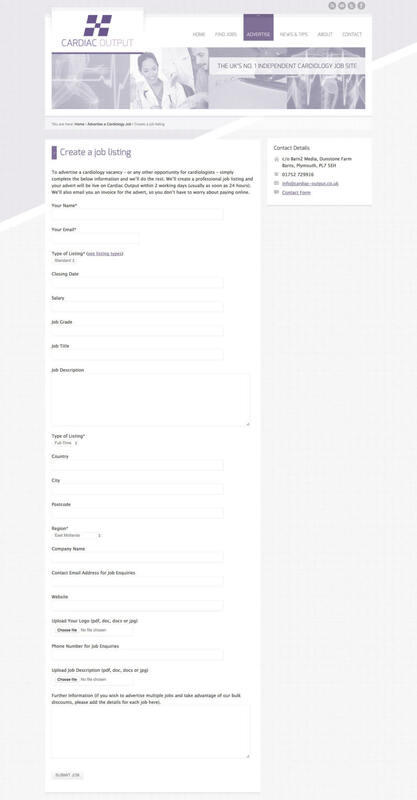 You need to add a ‘Submit a Job’ form to your website where employers can enter all the vacancy details. You can also use it to take other information such as the employer’s contact and payment details. Manual payment for job listings – Set up the form as described above. Make sure it’s held for moderation if people have to pay before the job advert goes live. Manually send an invoice to the job advertiser. PayPal payment for job adverts – Gravity Forms has a PayPal add-on that lets employers pay using PayPal before they can submit a vacancy to your WordPress job board. How will you use the WordPress job search plugin? In this tutorial, I’ve told you everything you need to know about how to combine different WordPress job board software to create a fully functioning jobs site. You’ve learned how to create a dedicated ‘Jobs’ section within WordPress. You know to add extra fields of information to your jobs. You’ve also learned to list your jobs in a front end WordPress job board, with extra features such as job search and filters. Now it’s time to put it into practice. Posts Table Pro comes with full support, so get in touch if you need any help or advice. I’d love to hear how you get on with the WordPress job plugins – please leave your comments below. Hi Dave, thank you so much - you can tell I only updated the Cardiac Output site this week! That link went to a page from the old job board plugin which we have removed. I have fixed the broken link now. I watched your video, used the plugins but my downloads section is not working. other than showing the download link users are seeing the file location in my website. How can I fix this? Hi Samwel, you need to add an actual clickable link to the Download custom field. If you just add the file URL then it won't be clickable. There are full instructions on how to do this here.